The Dollar-price to Buy Gold in the wholesale spot-market bounced from a 0.7% dip early Thursday, holding above $935 after gaining $30 an ounce so far this week. European stock markets faltered after rising once again, adding 0.5% on average by late afternoon. Both the Euro and British Pound ticked back from new 2-week highs, holding the Gold Price in Sterling at £570 an ounce. 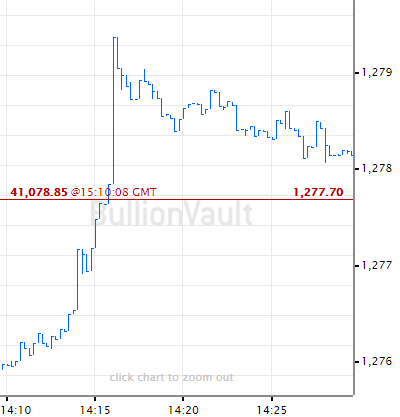 French, German and Italian investors looking to Buy Gold today saw the price drift back to €663 – some €10 per ounce above this time last Thursday. 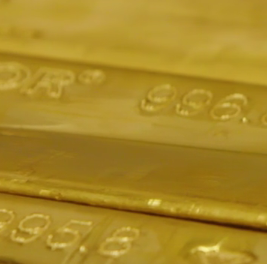 "Price action is currently gaining strength, but we will not see fresh buying come into the market until Gold can close above $943," says today's technical note from London market-makers Scotia Mocatta. A fellow London dealer also points to that Dollar-price as "a major resistance level back in June." Crude oil meantime slipped half-a-dollar to $61 per barrel. Government bonds ticked higher from Wednesday's sharp sell-off, pushing the 10-year US Treasury yield down to 3.77%. US stock-market futures pointed higher again, after former investment-bank J.P.Morgan followed Goldman Sachs' forecast-beating report with record quarterly earnings up 36% from April-to-June last year. Today's TIC report of investment flows into US securities showed foreign investors buying $17 billion of American equities in May, while central banks sold $22bn of Washington's government bonds. Foreign owners also quit $43bn of short-term commercial US debt instruments, while US investors sent $37bn overseas to create a net outflow of nearly $67bn. 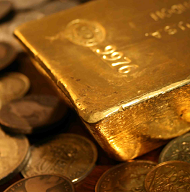 Almost twice the outflow of April, that was lower than record $88bn outflow seen in Feb.
Now standing at some 1,040 tonnes – down from 2,590 a decade ago, but still worth 38% of the country's foreign-exchange reserves – Switzerland's gold is also partly held in foreign countries, it said. South of the Alps, meanwhile, the Italian government was told by the European Central Bank (ECB) on Tuesday to halt plans to charge the Banca d'Italia capital gains tax of 6% annually on its bullion holdings. The proposal, part of draft laws aimed at raising emergency cash for the public purse, comes as Rome's budget deficit for 2009 tops 5% of gross domestic product, well above the Eurozone's agreed limit. No.4 in world rankings for central-bank gold with 2,451 tonnes, the Bank of Italy has so far joined the German Bundesbank – world No.2 behind the United States – in resisting all political calls to sell part of its reserves. "Although the amounts that may be payable by the Banca d'Italia are difficult to ascertain," says the ECB in its open letter, "they could be substantial and would have an impact on the Banca d'Italia's gold reserves." Current Bank of Italy governor Mario Draghi is widely expected to succeed current ECB president Jean-Claude Trichet when his term ends in Nov. 2011. Milano Finanza meantime reports today that the Banca d'Italia is going ahead with the closure of 33 local branches. Back in the United States, commercial lender CIT moved closer to bankruptcy after the government refused to extend its $2.3 billion rescue of the $5.3bn creditor, which counts fast-food franchise Dunkin' Donuts amongst its debtors. California's state pension fund Calpers filed a lawsuit against the big 3 credit-ratings agencies for "wildly inaccurate" AAA ratings which it says led the United States' largest retirement fund to lose $1 billion on high-risk mortgage investments. Former US Treasury secretary and ex-Goldman Sachs chief Hank Paulson was meantime due to testify before a House investigation into the collapse of Merrill Lynch and its sale to Bank of America. Paulson admitted Wednesday that he threatened BoA chief Ken Lewis with immediate dismissal if he didn't complete the Merrill deal, despite losses at the investment bank which would hurt Lewis's shareholders.